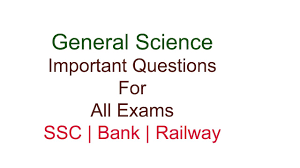 SSC CGL GD Clerk LDC UP Police Delhi Police Rajasthan Police Patwari exam CTET REET PSTET CTET, TGT, PGT, B.Ed HTET CSAT NDA CDS and RPSC 1st Grade 2nd Grade Teacher railway loco pilot group D group C Exam. Question (1). Which stimulant exists in tea? चाय में कौन-सा उत्तेजक विद्यमान रहता है? Question (2) What causes philariasis disease? फाइलेरिया रोग किसके कारण होता है? Question (3) What is Vitamin-A the chemical name? विटामिन-A का रासायनिक नाम है? Question (4) Where is the application of cryogenic engines? क्रायोजेनिक इंजनों का अनुप्रयोग कहाँ किया जाता है? Question (5) What glands are found on the side of palak? पलको के किनारे कौन-सी ग्रंथियाँ पाई जाती है? Question (6) which part of the human nervous system there is no enzyme found? मनुष्य की आहार नाल के किस भाग में कोई एंजाइम नहीं पाया जाता है? Question (7) Which enzyme is released from the stomach wall? आमाशय की दीवार से कौन-सा एंजाइम निकलता है? Question (8) What type of tissue is blood? रूधिर किस प्रकार का एक उत्तक है? Question (9) Whose split occurs in Cytokinesis? साइटोकाइनेसिस में किसका विभाजन होता है?